I attend both meetings and conferences infrequently enough that I still get a kick out of what is most certainly ho-hum to the regulars. Such as, starting off a presentation with ‘first a little housekeeping’; which, according to cheesycorporatelingo.com means: (1). Something that needs to be done that absolutely no one cares about. My own observation is that it can also function as an excuse of sorts; a preamble to this should have all been taken care of earlier but it wasn’t so now that we’re all assembled, time to tidy up. The combination of lack of motivation post happy hour and puffy eyes in the morning shall keep me from going on any major benders. And, alas, the return of my cough in the evening has necessitated the moving up of my next scan, so the party may be winding down. In the meantime, the past few weeks have been blissfully busy; I have been rushing from one activity to another with all the energy that this break from treatment has afforded me. Now that I’ve gotten the (ahem) housekeeping out of the way, I shall begin to recount some of these adventures. I have continued to swim my (almost) daily laps, although after I made it to ninety-five lengths I had to dial it back a bit. Fifty, or a third of a mile, is much more doable. 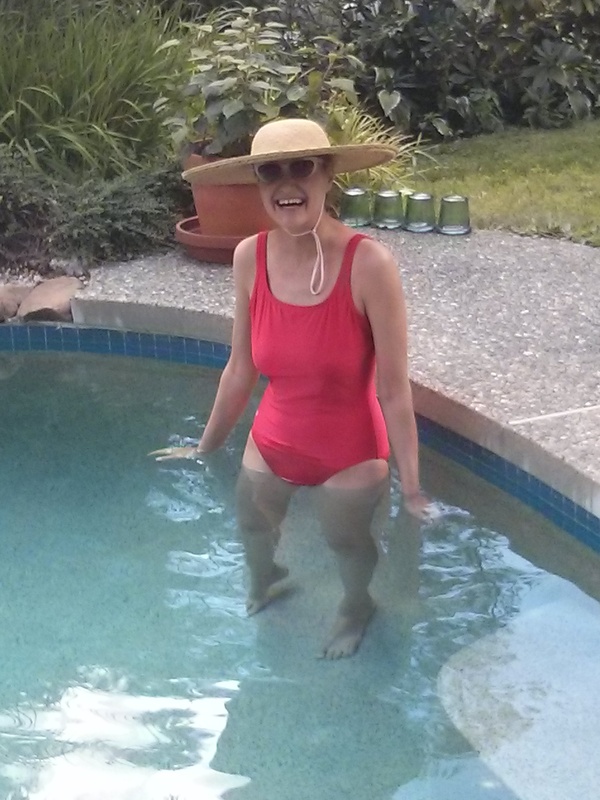 Anyway, I had just suited up (old red speedo, sunglasses, giant sun hat) and was acclimating myself to the water. Peter and his friend Miggles (that’s what they call him) were enjoying breakfast poolside. As I stood there I noticed that they were looking at me and laughing. I couldn’t understand what they found so funny (although I was afraid that if I thought long enough I might figure it out), so Peter took a picture and brought it over to show me. Well, the lower half of my body had been optically distorted so that I now appeared to be a woman with fantastically stubby legs. It was fairly amusing, and only a tiny bit alarming when Miggles asked Peter to send him a copy. If I end up in one of those pop-up ads on the internet, they’re both in trouble.